If it's always been your dream to swim with dolphins, join us for a Dolphin Encounter! 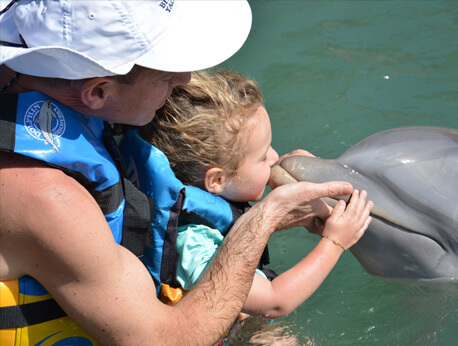 This activity allows you to swim and play with our friendly dolphins as they kiss, hug, and shake hands with you! You will enjoy a full 30 minutes of play in the Caribbean's clear waters. For a fun vacation activity the whole family will love, join us at Dolphin Discovery St. Kitts for our Dolphin Encounter experience! In this program, you can interact with our charming marine mammals in the warm Caribbean waters for a one of a kind experience. Stand on a platform to watch the dolphins perform for you, then get ready for them to give you a hug, kiss, or handshake! You will also get to swim and play with the dolphins in the waters they call home. They are very friendly so give them a nice caress! The dolphins' happy smiles are sure to put a smile on the face of every member of your family. This safe, unique experience will help you make memories you and your family will treasure for the rest of your lives! The Dolphin Encounter program costs just $99 for guests over 4'7" tall and $89 for guests from 3'3" to 4'7" in height. These prices include a 15-minute briefing with our trainers and 30-minutes of swim time with the dolphins. Children ages 1 to 7 years old must swim with a paying adult, but guests ages 8 and older may participate on their own. Please be sure to arrive at least 30-minutes before your reservation to ensure you are present for your important informational briefing. We offer this program daily, on the hour, starting at 9 a.mm and going until 3 p.m.
At Dolphin Discover we take the safety of our guests and animals very seriously. Because of this, there are a few regulations methodically put in place to grant our visitors the safest possible environment. Pregnant women who have passed the 5 month mark are unable to participate in this activity. If you are less than 5 months into your pregnancy, you may enjoy the Dolphin Encounter program with another paying adult after signing a release form. To ensure your health and safety as well as the safety of the dolphins, please be sure to wear biodegradable sunscreen as this will keep your skin protected but will pose no threat to the dolphins. IMPORTANT: a valid passport is an essential requirement to visit St. Kitts. Children are 3'11" to 4'6" and adults are 4'7" and taller. 1 to 7 year old children can participate with a paid adult. 8+ year olds can swim on their own. In St. Kitts, groups have a maximum of 20 people for a closer experience.